The 11th artwork to sit on Trafalgar Square's Fourth Plinth has been unveiled. 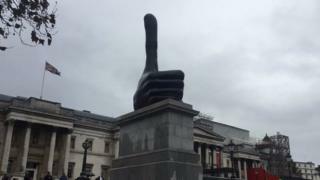 Really Good by David Shrigley is a 7m-high sculpture of a hand giving a thumbs up sign, which the artist hopes will become a self-fulfilling prophecy. It has been cast in bronze with the same dark patina as the other statues in Trafalgar Square. The Fourth Plinth Programme invites world-class artists to make new works for the capital. "It's a work about making the world a better place... which obviously is a ridiculous proposition, but I think it's a good proposition," he said. The Mayor of London, Sadiq Khan, said the "positivity and humour" in Really Good "truly encapsulated the spirit of London". "What it represents is so important - optimism, positivity, the best of us. This sculpture is so important showing Londoners…tourists…that London is open. "The changing artworks on Fourth Plinth continue to be a source of delight, discussion and debate and I am proud to be the mayor of a city that has such an energetic and vibrant cultural life," he added. Really Good replaces Gift Horse, a skeletal sculpture that displayed a live feed from the London Stock Exchange by German artist Hans Haacke. Mark Wallinger's figure Ecce Homo was the first piece to stand on the empty plinth - in the north-west corner of the square - in 1999. Other works included Alison Lapper Pregnant by Marc Quinn (2005), Nelson's Ship in a Bottle by Yinka Shonibare (2010) and Elmgreen and Dragset's Powerless Structures, Fig 101 - a sculpture of a boy astride his rocking horse.